After many many many months of not drilling in the Obulle area, we now have the missing piece! Bentonite! Thank you Lord! We have been looking, calling, asking, emailing, and trying other alternatives with no luck. Our team of guys in Obulle have been ready to drill now for months and have also been involved in the search for our drilling mud. A few weeks ago Colin sat down one last time and tried looking up bentonite clay in Uganda, and he found some! This was a legitimate mining company in Uganda and they mined sodium bentonite (NaBe). We sent Dan and Emma to Kampala on the over night bus to check it out and when we got the call that everything was good we loaded up a truck. Less than 24 hours later Colin, Dan and Martin unloaded 80 bags of drilling mud. God is good!!! I was looking at the pictures that we have of Silas from when he was at Amecet. I can see where he is the same little boy, but then I can't get over how much he has changed from his first picture ever taken. He was just a little guy for sure. Silas's very first picture of his little life. This is the one that hangs on the wall at Amecet. When we go and visit the staff that took care of him, I always go and show him his picture. We also spend some time looking at all the little ones that have come through Amecet over the years. When looking at the wall of photos, if there is picture with a little star sticker it means that that little baby died. Sadly there are a good number of those stars. However, this little picture doesn't have one. 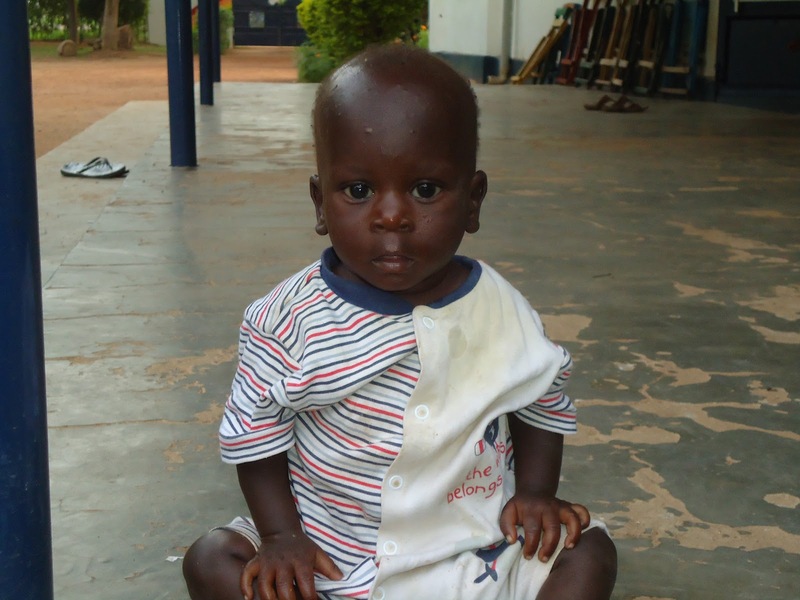 God was protecting little Silas as he lay abandon and sick. In my heart I know that God's plans for this baby are bigger than anything I can think of! This is that same little boy about 9 months later! Colin and I can not picture our little home without him. He is ALWAYS happy and singing and talking and laughing. God's plans to restore us are made abundantly clear when I think about Silas and his story thus far. What a huge blessing this little man is in our lives. We are thankful that God has given him to us. 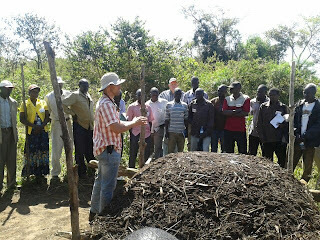 Many of you have seen or read about the new way of farming that we are working with in the village. If you go back a few blog post you will see the gardens we have been working on. 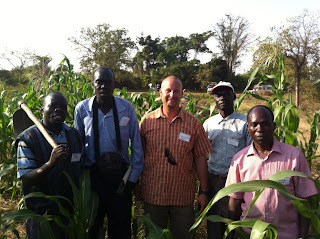 We attended the first Farming God's Way training in August of last year and took Dan and Charles along with us. 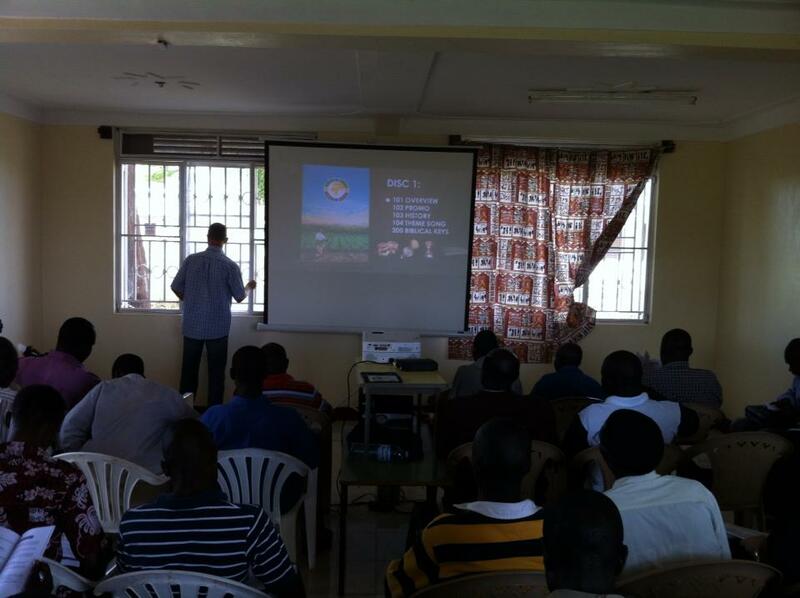 Charles then attended a second training in Mbale a few months later. The guys had already put in one small test garden and built the compost pile by that time. 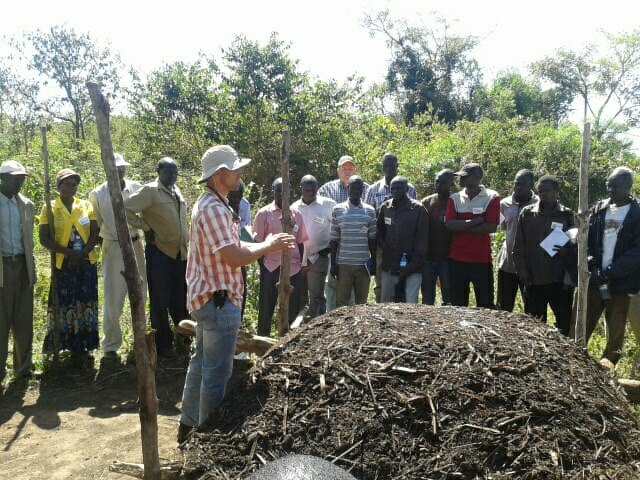 The second training was good for Charles (along with four other guys) because he was able to ask the trainer, Chris, questions that you would only have if you have in fact tried this way of farming. We decided to invite Chris to come to Soroti and we would host a FGW training here in the Teso area. The last day of training in Obulle. One of our teammates from Soroti/Pamba area, Steve and the crew he brought to the training. 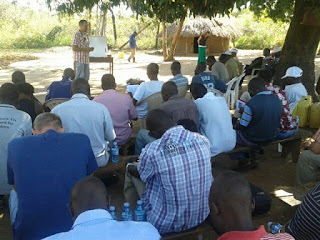 The first two days were at Global Care. It was a great training and both Colin and I are excited to see what God does. We have a very large group in the village that are putting in FGW plots and we are more than thrilled to see that even more want to know how to do this new way of farming. We were just at the church last night and our friends, Dan, Charles, Emma, Martin, and Michael all told us that their wives want to know how to do this as well. So it looks like I will be teaching the ladies of our church the "how-to's"! It is really neat that the ladies want to know how to do this. Often times the husband goes through the training, but unless the wife is on board, it has a hard time getting off the ground. Once the planting is done in the traditional method, it is mainly the wives that do the garden work. So if I can get the women of Obulle on the same page as their husbands, then we will be in the FGW business!